(PhysOrg.com) -- Observations from NASA's Wide-field Infrared Survey Explorer (WISE) mission indicate the family of asteroids some believed was responsible for the demise of the dinosaurs is not likely the culprit, keeping open the case on one of Earth's greatest mysteries. While scientists are confident a large asteroid crashed into Earth approximately 65 million years ago, leading to the extinction of dinosaurs and some other life forms on our planet, they do not know exactly where the asteroid came from or how it made its way to Earth. 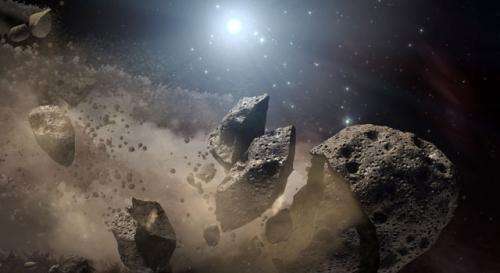 A 2007 study using visible-light data from ground-based telescopes first suggested the remnant of a huge asteroid, known as Baptistina, as a possible suspect. According to that theory, Baptistina crashed into another asteroid in the main belt between Mars and Jupiter about 160 million years ago. The collision sent shattered pieces as big as mountains flying. One of those pieces was believed to have impacted Earth, causing the dinosaurs' extinction. Since this scenario was first proposed, evidence developed that the so-called Baptistina family of asteroids was not the responsible party. With the new infrared observations from WISE, astronomers say Baptistina may finally be ruled out. "As a result of the WISE science team's investigation, the demise of the dinosaurs remains in the cold case files," said Lindley Johnson, program executive for the Near Earth Object (NEO) Observation Program at NASA Headquarters in Washington. "The original calculations with visible light estimated the size and reflectivity of the Baptistina family members, leading to estimates of their age, but we now know those estimates were off. With infrared light, WISE was able to get a more accurate estimate, which throws the timing of the Baptistina theory into question." WISE surveyed the entire celestial sky twice in infrared light from January 2010 to February 2011. The asteroid-hunting portion of the mission, called NEOWISE, used the data to catalogue more than 157,000 asteroids in the main belt and discovered more than 33,000 new ones. Visible light reflects off an asteroid. Without knowing how reflective the surface of the asteroid is, it's hard to accurately establish size. Infrared observations allow a more accurate size estimate. They detect infrared light coming from the asteroid itself, which is related to the body's temperature and size. Once the size is known, the object's reflectivity can be re-calculated by combining infrared with visible-light data. The NEOWISE team measured the reflectivity and the size of about 120,000 asteroids in the main belt, including 1,056 members of the Baptistina family. The scientists calculated the original parent Baptistina asteroid actually broke up closer to 80 million years ago, half as long as originally proposed. This calculation was possible because the size and reflectivity of the asteroid family members indicate how much time would have been required to reach their current locations -- larger asteroids would not disperse in their orbits as fast as smaller ones. The results revealed a chunk of the original Baptistina asteroid needed to hit Earth in less time than previously believed, in just about 15 million years, to cause the extinction of the dinosaurs. "This doesn't give the remnants from the collision very much time to move into a resonance spot, and get flung down to Earth 65 million years ago," said Amy Mainzer, a co-author of a new study appearing in the Astrophysical Journal and the principal investigator of NEOWISE at NASA's Jet Propulsion Laboratory (JPL) in Pasadena. Calif. "This process is thought to normally take many tens of millions of years." Resonances are areas in the main belt where gravity nudges from Jupiter and Saturn can act like a pinball machine to fling asteroids out of the main belt and into the region near Earth. The asteroid family that produced the dinosaur-killing asteroid remains at large. Evidence that a 10-kilometer (about 6.2-mile) asteroid impacted Earth 65 million years ago includes a huge, crater-shaped structure in the Gulf of Mexico and rare minerals in the fossil record, which are common in meteorites but seldom found in Earth's crust. In addition to the Baptistina results, the NEOWISE study shows various main belt asteroid families have similar reflective properties. The team hopes to use NEOWISE data to disentangle families that overlap and trace their histories. "We are working on creating an asteroid family tree of sorts," said Joseph Masiero, the lead author of the study. "We are starting to refine our picture of how the asteroids in the main belt smashed together and mixed up." Thank you, NASA, for this interesting news story. This illustrates Earth's constantly changing climate. I remember when the early debates on this subject finally settled on consensus opinions of a violent end to dinosaurs by impact of a comet or large meteorite. Both are possible in our dynamic neighborhood! Unfortunately consensus scientific opinions on the causes of Earth's changing climate have recently been directed by world leaders (Al Gore, the UN's PCC, etc ) who have no grasp of solar cycles and our violently dynamic neighborhood [1,2]. We should all be aware by now that the Dinosaur were wiped out as they new the secrets of repulsive neutrons, this and their level headed and tiny brained denial of global warming, the asteroid that wiped them out was terrible vengeance for such heresies against the Brandenburg Orchestra. The fact that the tiny dinosaur brains were able to grasp the idea of repulsive neutrons speaks volumes for the ability of my mind. "I believe in Repulsive Neutrons, please o'lords of repulsion protect us from the ORCHESTRATORS of the wise Dinosaurs doom"
Go now, if your chants are sincere I will hear you as I am attuned to the ways of the Cosmos as are few men, we may yet be saved. Remember I'm a charter member of "Neutron Abhorrents Mandated By Laughable Assertions"
If a huge asteroid caused the demise of the dinosaur, surely we should have found all kinds of other animals, birds and perhaps even fish that died in the same way? Is there any evidence of these other items having died then? Now therein lies a double edged sword. So be careful before jumping down my throat with ill-thought out answers. Why are most if not ALL dinosaurs fossils buried in sedimentary deposits left by flood water instead of dust deposits left by an asteroid strike? Where did all the water comes from? In fact, just where DID all the water on earth come from such that the moon is dry, Venus is dry and Mars also is dry and yet Earth is drowning in the stuff? Surely those bodies should also be as wet as the sea? Yet it isn't. So where did the water come from. Same question as where did the asteroid come from? If a hue asteroid caused the demise of the dinosaur, surely we should have found all kinds of other animals, birds and perhaps even fish that died in the same way? Is there any evidence of these other items having died then? Please Kevin, do some serious research first before posting. Why are you asking random people on the internet for answers that you could look up yourself? Perhaps you have an agenda? Just get used to the fact that is was a - recurring - alien bio-harvest, ok?.. Mars seems to have water but it is all frozen. The other planets could have had water in their pasts, but the lack of a protective magnetosphere and atmosphere let it strip away. Mars seems to have water but it is all frozen. Yes that is an interesting observational fact. It may reflect the natural evolution of our Sun  - the main heat source of planets. And ask ourselves, "What's in there?" 1. Did you kill Dino? 2. Do you cause climate change? 3. Do you cause solar eruptions? Maybe the answer lies hidden inside the glowing sphere of waste products that emits photons and we call the photosphere. So, does this fall into the category of known unknowns, unknown unknowns or probably will never knows? I guess when it comes to scientific publishing, sometimes it's better to know nothing than not to know anything at all. If a huge asteroid caused the demise of the dinosaur, surely we should have found all kinds of other animals, birds and perhaps even fish that died in the same way? We have evidence of change in fossils from before and after the time period we do not have fossils from every five minutes. Why are most if not ALL dinosaurs fossils buried in sedimentary deposits left by flood water instead of dust deposits left by an asteroid strike? Dinosaur did not all survive until the extinction event. We have evidence of evolution of dinosaurs over millions of years and then a sudden stop of fossil evidence. Dinosaur fossils date over a great range of time as if you didn't already know that. What I know is one of the known unknowns. Or maybe one of the unknown unknowns. Is it a meta unknown unknown if you can't even classify it? Where did all the water comes from? In fact, just where DID all the water on earth come from such that the moon is dry, Venus is dry and Mars also is dry and yet Earth is drowning in the stuff? Surely those bodies should also be as wet as the sea? Yet it isn't. So where did the water come from? Good question - nothing to do with the dinosaurs though. Since much of the smaller bodies in the solar system contain ice that could well have been a good source of water. Maybe all the bodies of the solar system had water at the start as well - if gravity is not strong enough that water would evaporate at any orbit inside of Jupiter earth gravity is strong enough to hold water at the temperature we have. Venus is too hot to hold water. Mars has enough gravity to loose water slowly but not enough temperature to have water much vapour. So Kev although water is fun and is being studied - I don't think you really want to know the actual answer. Indeed we should have. And we did. Get an education Kevin. From someplace besides Nonsense In Genesis or the Discoveries Are Vile Asylum. Is there any evidence of these other items having died then? Lots and lots. For instance 50 per cent of plankton species went extinct. So be careful before jumping down my throat with ill-thought out answers. Because over millions of years dinosaurs found all kinds of places and times to die. Now IF the Great Flood had actually happened and the Earth was really less than 10,000 years old then indeed the dinosaurs should have been drowned. So how come there is no evidence of them ALL being drowned. Just a few dozen here and there now and then in what were clearly river bends. instead of dust deposits left by an asteroid strike? We don't have that either. The deposits are pretty thin over most of the Earth except around the Chixulub crater. Apparently the conditions were bad for fossils. Acid rain might be the cause of that. What water? There is no evidence for your Flood Kevin. Seems that it might have come from comets. WAY too hot for liquid water. Too small but it does have some. Frozen. Under the dust mostly. Earth is drowning in the stuff? But the third planet was just right and the comets came here to stay. Just like the bear. Surely those bodies should also be as wet as the sea? No. Perhaps your god forgot. Forgot to leave evidence of a Great Flood as well. Same question as where did the asteroid come from? The same place the Earth did only they didn't form a planet. Jupiter is likely the cause of that. Now would like to show that you are here to discuss this and not just a hit and run coward? "Why are most if not ALL dinosaurs fossils buried in sedimentary deposits"
No need for either Repulsive neutrons nor a boat that was way to small to fit all of the species of dinosaurs. "No one whose testicles are crushed or whose male organ is cut off shall enter the assembly of the Lord. Deuteronomy 23:1"
So which half of Lance Armstrong is allowed in? I am not a palaeontologist. But in all that I have read out of interest, it appears that all Dinosaur fossils have been found below the KT boundary. If that is correct, it would suggest very strongly that Dinosaurs had died out before the asteroid impact. Something as simple as a change in plant life could have caused it. Because if the herbivors died out there would be nothing left for the carnivors so they would also die out. I would be very interested to hear from any palaeontological source who could tell me if any dinosaur fossils have ever been found above or protruding through the KT boundary. it appears that all Dinosaur fossils have been found below the KT boundary. There is some recent evidence that some dinosaurs may have survived for a some time afterwards. It was on this site in the last few months, I think, but I can't find it at the moment. No that does not follow. If they were killed in the disaster that is exactly what we should find. Something as simple as a change in plant life could have caused it. No. That would require multiple species of plants, to change at the same time. Water is all over the solar system: Moon (yes, in pretty good amounts at either pole), Mars (again, in the polar regions and apparently in the soil at lower latitudes), Europa, Ganymede, Callisto, the rings of Saturn, Enceladus, possibly Rhea, numerous asteroids (probably dirt covered coments), comets, and very probably, much of the Oort cloud. Where is the the water? Indeed. ...Surely those bodies should also be as wet as the sea? Yet it isn't. So where did the water come from. Same question as where did the asteroid come from? The Dinosaurs ran out of cheesy poofs - thus they had no reason to live and gave up. Same thing will happen to us.